To conduct research and development in the field of Geo-Mechanics & Back Filling to determine various physico-mechanical properties of rock, promote safe ground support methods and technologies, ground control solutions for mining industry including stowing and paste filling. Department received National Award for carrying out R & D for use of fly ash for stowing of underground mines, jointly awarded by Ministry of Power, Ministry of Environment & Forest and Department of Science and Technology, Govt. of India. Introduction of Resin bolting as a system of support in Indian coal mines. Successful completion of design of support system with Resin grouted rock bolts in all the mines of South Eastern Coal field limited (SECL). Successful elimination of goaf edge support with Resin grouted rock bolts in depillaring panels of Singareni Company Collieries Limited (SCCL) which reduced the chance of underground accidents due to loosening of cog support. Publication of 5 research papers in International Journal (SCI -3, Scopus -1, Other -1). Successful completion of one project in MCL on chair lift man transporting system which will increase the efficiency of mine official as well as workers which would directly affect the production cost of the mine. Successful instrumentation work from last 10 years at Jitpur mine, IISCO to assess the roof convergence for better safety and productivity of the mine. Successful completion of more than 150 research projects related to Rock Mass Characterisation , Support Design and Stability analysis for underground coal mines. From the year 2000 to till date nearly 128 nos. 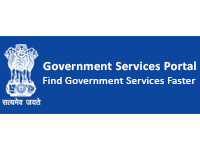 of projects have been successfully conducted for various agencies. Conducted Insitu investigations such as Direct shear test for rock to rock and rock to concrete, Plate load test, Flat jack test, Hydrofracture test for insitu rock mass properties at different location of Lower Subansiri Hydro Electric Project (HEP) & Middle Siang HEP of Arunachal Pradesh, Teesta IV & V HEP of Sikkim, Nimo Bazgo HEP, at Pakal Dul HEP & URI HEP of Jammu & Kashmir. Laboratory investigation for borehole rock core samples were carried out to understand the characteristics of intact rock formations mostly from coal measure formations. Most of these projects are related to study of rock mechanical properties for design of different surface/underground structures of short, medium and long term stability, for safe and cost-effective extraction of coal/metal/non-metal from underground or from surface pits, for Coal bed methane projects etc. Investigation on methane emission for categorisation of degree of gassiness of coal seams having belowground workings, Prediction of specific gas emission in belowground mine workings, fugitive emission to the atmosphere from coal mining and handling activities and oil and natural gas systems, evaluation of coalbed methane and shale gas resources in virgin coal/lignite/shale blocks, construction of high pressure adsorption isotherm at reservoir temperature for determination of recoverable gas resource, surface area, pore size and pore volume, petrographic, mineralogical and reflectance studies, CBM reservoir simulation, coal mine methane, ventilation air methane geo-sequestration of CO2, baseline study on carbon foot print of coal mines, underground coal gasification. Investigation on methane emission from coal seams for classification of degree of gassiness has been carried out for more than 100 underground coal mines in India. A mathematical model has been developed for prediction of specific emission from seam being worked and enclosing strata into mine workings. The model is being extensively used for prediction of methane emission in prospecting mines. Methodology and national emission factors have been developed for estimation of fugitive methane emission from coal mining and handling activities. Prepared estimates of fugitive methane emission from coal, oil and natural gas systems for India’s Initial and Second National Communications and Biennial Update Report to the United Nations Framework Convention on Climate Change (UNFCCC). A set up has been developed by this group for determination of in-situ gas content of coal/lignite/shale core samples by the “Direct Method”. It is comprised of desorption apparatus, desorption canister and grinding apparatus. A format to record borehole/well location, various parameters related to core drilling and recovery and gas desorption volume with time elapsed, canister temperature and ambient pressure and temperature has been prepared. An excel spread-sheet has been developed for computation of desorbed gas volume at NTP or STP, desorption curves and sorption time. Facilities for determination of highpressure adsorption isotherm of coal/shale at reservoir temperature, quality analysis of coal and shale gases, chemical and petrological properties of coal/shale core samples have been developed through external funding such as UNDP, DST, USEPA and CIL. This section has investigated more than 250 boreholes and about 20 CBM wells. On the basis of CIMFR study, 33 CBM blocks have been awarded to gas producing companies in four rounds by Directorate General of Hydrocarbon (DGH), New Delhi. Technical inputs for commercial development of CBM projects have been given to almost all CBM producing companies such as ONGC, GEECL and Essar Oil Limited. At present this section has two ongoing S&T projects sponsored by the Department of Science and Technology, Ministry of Coal, and one network project on Underground Coal Gasification. Mr. Binod Gope T. S.
Mrs. Sukhbindar Kaur T. S.
Laboratory facility to determine Physico-mechanical properties of back fill material. Numerical modelling software (PLAXIS-3D) for stability analysis of back filled working. Instrumentation and monitoring of backfilled/stowed panel in underground Mines. Technology for filling coal ash in underground and opencast coal mines. Technology of utilizing granulated slag, crushed and washed overburden etc as a filling material. Paste fill material preparation facility. Facilities for conducting different laboratory physico-mechanical properties of rock core samples such as Geological Logging, RQD, Density, Porosity, Moisture content, Water absorption, Slake Durability Index, Compressive Strength, Tensile Strength, Direct Shear, Triaxial Strength, Young’s Modulus, Poisson’s Ratio, Point load Index, P & S wave velocity, Protodyakonov index, Mechanical properties of Conveyor belts etc. Studies for data collection and monitoring of benches to enhance safety and for environment friendly disposal of coal ash in opencast mines. Laboratory investigation to monitor pond ash filling in admixture with overburden at their captive mines included carrying out field investigation with respect to air quality monitoring, monitoring of sub-surface aquifers, hydrometeorology, ground water flow pattern, water quality in the core and buffer zone of the mine. Suitability studies on coal ash sample as an opencast backfill material and to provide the design guidelines for environment friendly dumping of coal ash in admixture with overburden at the nearby captive open cast coal mine. 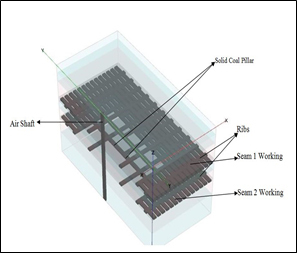 Suitability studies on coal ash sample as a backfill material. 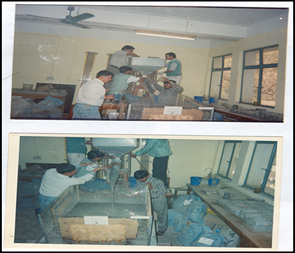 Field studies during ash stowing operations at GDK – 1&3 mines of SCCL regarding various ash stowing parameters. Rock mechanic instrumentation, Stability analysis and strata monitoring for depillaring with stowing. Advice on the use of bottom ash for underground stowing and field studies during ash stowing operations at RK - 7 Incline, SCCL regarding various ash stowing parameters. 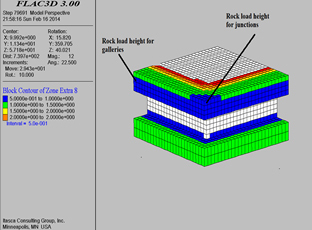 Identification of exact void location from surface, depth of void from surface, Stability of parting and safety factor, characteristics of the roof rocks in the void area. 2. 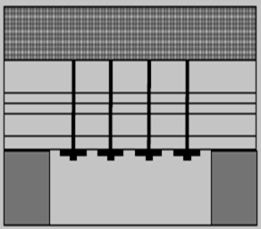 Characterisation of roof rock. 3. Design of suitable support system. Extraction of coal would be possible in more safer and economical way. Stability of the NH-2 will be assessed with desired factor of safety. This would further help the country as well as the locality as NH-2 is the life line of the country. 1. Rock Mass Classification of the mine drift and gallery. 2. To estimate the rock load height and rock load empirically for the same. 3. To estimate the rock load height and rock load numerically i.e. from numerical models. 4. To design suitable support system for the man riding gallery of IX seam as well as for drift. 5. To suggest the appropriate man riding system for drift and gallery of IX seam workings. This study help mine management for installation of main riding chair lift system for transportation of mining official and workers which will save time of travelling and also on the another hand , increase the working efficiency of mining people. Design of support system with resin bolts based on geotechnical studies of roof rocks. Mine management would able to extract coal with proper safety and productivity. 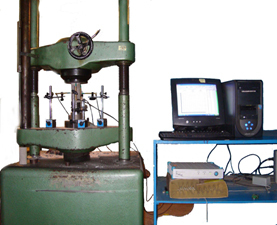 To determine Compressive strength of coal and Rock Cores and advice after statistical analysis of data. Determination of UCS, P & S Wave velocity, Elastic and Triaxial properties of granite core samples to study the reservoir triggred seismicity in Koyna-Warna region. Rock mechanical property determination from borehole rock samples for Gold mining. 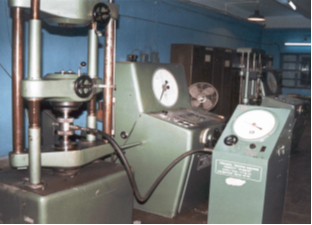 laboratory investigation on borehole rock core samples for determination and statistical analysis of different rock mechanical properties. Determination and statistical analysis of different rock mechanical properties for coal mining. Rock properties required for conventional shovel dumper combination with 10m bench height at Matun Rock phosphate Mines. Rock mechanical properties required for exploitation of coal from Banhardi coal block. Determination of UCS & Elastic properties in dry and saturated condition for their study for CBM exploration. Determination and statistical analysis of different rock mechanical properties of different borehole rock formations for coal mining. To investigate different physico-mechanical properties of two borehole rock/coal samples as a part of detailed exploration work. To determine physico-mechanical properties of borehole rocks as a part of their study of mine development and mass production of coal by using Longwall Mechanization. To investigate different physico-mechanical properties of borehole rock/coal samples for coal mining. To determine physico-mechanical properties of borehole rocks as a part of their study of mine development and coal production. To evaluate the physico-mechanical properties in the laboratory and in-situ permeability.